The word "slider" used to be associated with mobile handsets only. Then sliders appeared among communicators. But these products had the same designated purpose, so the situation didn't change radically. 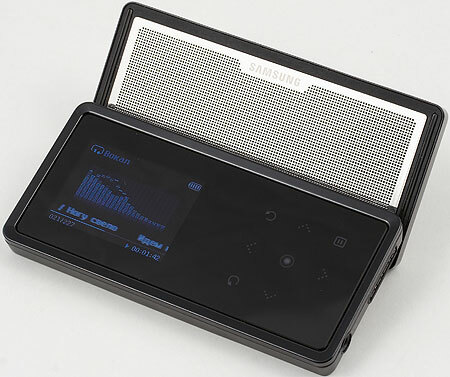 Until Samsung has launched the first MP3 player, which sliding part houses built-in speakers instead of buttons (like in mobile handsets). Manufacturers of such products haven't designed anything unusual for a long time already — let's see what Samsung offers. The box itself is unusually small. Even smaller MP3 players are usually packed in noticeably larger boxes. There is a label on it running "100 hits are already yours" meaning that the device already stores 100 songs. The box is of an original design - it opens like a book. One of its "covers" contains a golden inscription "For you", which suggests an idea that it can be given as a present. The player comes with lots of flyers to register the product via mail, a warranty, and a Quick Start Guide, no localization. The localized document was found only on the official web site. Of course, most people will understand how to use this device without manuals, but at least main translations should have been included. 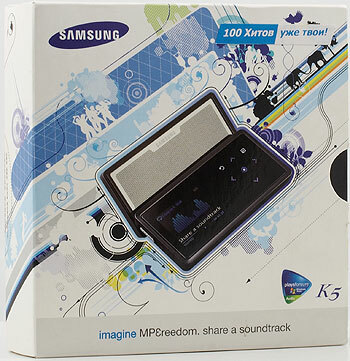 Along with the above said and the player itself, the box includes earphones of an unusual shape, a USB cable, and an installation CD with Samsung Media Studio. That's all. The neck strap is out of the question, because of dimensions of the device. The player has a magnesium case - rough surface, black, strict lines, rounded edges. We also heard rumors about a pink design for girls. The front panel is made of transparent plastic. It houses eight buttons. The bottom houses a standard 3.5" jack for earphones and a thin elongated USB connector. In my opinion, its usage is not justified in devices with such dimensions: it would have been more logical to use the standard mini-USB connector. It poses fewer problems, as it's an all-purpose jack and it's used in lots of devices. And finally, if it breaks, it can be easily replaced. In this case, when you notice a damaged cable, you'll have to run to a service center. On the other hand, Samsung always uses such cables, at least in players. There are no controls at the sides. There is only a slider on top, labeled "hold" - along with locking controls, it can be used to turn the device on/off. In fact, it's not quite correct to say about controls on top or bottom. These notions are fuzzy here. I'll give all the details in the next section. Orientation of sensor buttons on the front panel and the display changes automatically, when you slide out the built-in speakers. 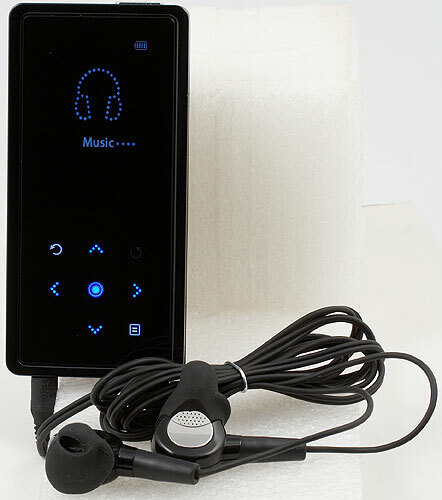 The display and buttons are in the upper part of the player, the bottom part is occupied by the speakers. The slider mechanism is rather comfortable — a gentle nudge from the thumb and the attached speaker effortlessly slides out and automatically pivots to position the speakers for optimal sound acoustics. It's a smooth process we have no gripes with. It's not worse or even better than in some handsets. By the way,it looks more like a mobile handset in terms of dimensions - 98 × 47.5 × 18.1 mm (W×H×D), because a modern idea of a flash player differs from what we can see here. Plus the sliding mechanism that is absolutely not typical. When you see this device in a hand of a passer-by, you will hardly think that it's a player — too large. So if you don't know about the built-in speakers, you may be surprised to hear about only two (one or four, depending on a price) gigabytes of on-board memory. On the face of it, it might have had a micro drive. But the built-in speakers are a determining factor here: they are the reason for 106 g and the above-mentioned dimensions. From the point of view of control, there are both advantages and disadvantages on the physical level. I think everybody knows already about pros and cons of sensor controls. On one hand, they look stylish. But they also have lots of drawbacks. Firstly, you cannot control the player without taking it out of your pocket — you'll have to fumble for it even in severe frost and then try to touch sensor buttons with frozen fingers — not an easy task. Secondly, irregardless of a season, you will have to aim your fingers well, because "mistouches" are rather frequent. That is, you have to prefer style to usability. We also have something to say about software. It's rather convenient. You navigate through the menus with the standard buttons forward/backward/left/right, the OK button in the middle, and the return button. There is one more button, which is responsible for extra functions — to open the list of available options (for example, to change animations and sound effects during playback, add the current song as an alarm signal, etc). All the buttons change their orientation, when you slide the speakers out. Unnecessary buttons fade away, useful buttons (for the new player layout) light up. But the usual modus of control is not changed. In the main menu, you can play music, turn on FM radio, configure an alarm clock, browse photos, configure the player itself. All icons are animated (nice but inconvenient) — animations are very long, but you have to wait until the end to see what function they hide. But you will learn the order of icons by heart in time and this won't be a problem anymore. Practically all your presses are accompanied by animations, spectacular at that. OLED contrast makes the display background blend with the case. So you see only labels and icons. This player copes with its main role without any problems. A user is limited to five preinstalled equalizer modes. But you will actually need only a couple of them — the others are just to show off. Manual adjustment is not available. You can choose either abstract animations or running bars of the graphic equalizer during playback. In fact, the processor of this device is not very fast, and all animations are not played very smooth. The display shows a progress bar, a song title from the tag or a file name (if it's not tagged). 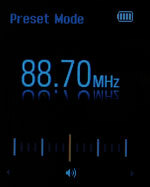 During playback, the display also shows the current equalizer mode, playback mode, battery charge level, an alarm icon (if it's enabled), the number of the current file, and the total number of files. We'd like to complain about problematic support for Cyrillic tags here. While there are no problems with OGG, ASF, and WMA, the situation with ID3 is not quite standard. The player reads tags in unicode, but it does not work with other russian formats. That is users will have to convert tags to the supported format. (Unfortunately we haven't tested the recent firmware version. But according to the manufacturer, there appeared an option to organize your library by tags). Let's proceed to audio. The bundled earphones do not look like any other models that come with many players. They are equipped with silicon buds that offer a bass-enhanced sound experience. But the earphones evidently fail to cope with medium and high frequencies. But this is far from the worst choice. If you are not an audiophile treasuring audio quality, you will like this model. Audio quality tests with cheap headphones (~30 $) revealed no noticeable problems. On the contrary, audio quality was very decent. Detailed audio test results are published below. Don't forget that the player is equipped with the built-in speakers. Frankly speaking, I didn't expect such pure and deep sounds from these tiny speakers. They are loud enough for a room. The alarm mode may even wake up your neighbors. You can actually use this device as a digital tape-recorder. The player copes well with this task. There is only one problem — battery life in this mode is just 5-6 hours. But if you use headphones, the device will last 20-25 hours. The second function in importance after music playback is probably FM radio. You must admit that lots of music and information (both useful and useless) comes from radio. Standard reception quality. It's no better or worse than in other models from various manufacturers. You can adjust sensitivity in settings. It's not much, but it still affects the radio quality and noises a little. You should also specify your region. There is an option to automatically store the first 30 radio stations in memory (the scan process is rather fast) and then to switch between them. You can open the list of saved frequencies. But unfortunately, you cannot name them. The process looks nice. A scale with marks moves on the bottom of the display when you scan channels or switch between presets (stored stations). 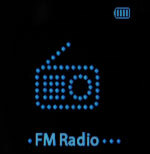 And the current frequency is displayed in a large font with a little reflection below - it looks very good. Like music, you can listen to radio in a group of people - just slide out the speakers. You will still have to plug earphones in this case, because they are used as an antenna. But it's a standard requirement. Offering your favorite music and built-in speakers at your disposal, it would be natural to use this model as an alarm clock. Engineers have taken care of it. You can select any track as an alarm signal. You can configure the alarm as you like – either one-time, or five days in a week, or 6, or every day. You can create up to six alarms. Along with songs from your library, there are also preloaded sounds. Of course, you should slide out the speakers before you go to bed, so that the alarm is louder. But the device will wake you up even with closed speakers. This function will certainly please many users. There is nothing unusual about the process of browsing photos. The display is too small for photos — 1.71", 128×160 - it can show only small pictures. Large photos are scaled down to fit the display, but the device needs some time to do that. Only JPEG is supported. When you transfer photos to the player with Samsung Media Studio, they will be converted to the necessary format, if necessary. (Unfortunately, as I have already mentioned above, the new firmware version hasn't been tested. But according to the manufacturer, there appeared a new option to zoom photos that were scaled down by the player). Moreover, this device can be used as a flash drive. You can upload music with Samsung Media Studio as well as with standard tools - Windows Explorer or any other file manager. Practically each company that manufactures MP3 players equips them with Media Studio, Library etc. As we can see, Samsung is not an exception. In fact, this program is nothing special — standard functions to manage your player. You can play music, create albums and playlists to transfer the to the player. You can also burn compact discs with music. When you connect your player to a computer, installed Samsung Media Studio is activated automatically. It can be used to upload music, photos, and playlists to the player. You cannot copy files (no matter music or data) from the player to a computer. But you can do it in the usual mode — just open the folder with a file manager. The data transfer rate from a computer to this player is approximately 2.8 MBps - an average result. The upload rate is 3.3 MBps, which even exceeds the read rate. That is we can see that the player has no problems with transfer rates. It can be easily used as a flash drive. When girls (and not only girls) see this original slider, their first words are almost always as follows: "Look, it's the MTV device!!!" So MTV-style girls will certainly like this new product. That's the effect of the wide-scale advertising campaign — the player was often used in video clips with Fergie and The Pussicat Dolls. Besides, we should take into account how often these clips are broadcast – I don't like such music and TV, and I still come across clips with this model from time to time when I browse channels. Fergie shows off this player for quite a lot of time (several seconds). It stays on screen even longer in the Pussicat Dolls clip, moreover it's shown in a close-up. It's certainly a good advertisement to attract new customers to this model. This player also took part in sweepstakes on Fergie's web site. Samsung is also promoting this product on its official web sites — they developed a special design, video clips, etc. You can see it with your own eyes on www.mpfreedom.com. This model is out of line of usual flash players available in our market. Both in terms of design and dimensions. Our market hasn't seen such player solutions — Samsung is the pioneer here. This device produces an impression of a stylish player rather than a workhorse for playing music. That's probably because it does not allow to record sound, be it radio, voice, or an external sound source. On the other hand, if you regard this device as a pocket boom box, its dimensions become quite small, even at the cost of reduced speakers (nevertheless, they are loud enough for a standard office room). Anyway, that's the first pocket recorder with flash memory we have ever seen. So this player deserves the Original Design award.